Researchers work with several automakers at the McMaster Automotive Resource Centre. In the first of our two-part series called Canada’s Other Auto Sector, we look at how automakers, government and universities are working together to forge an automotive future based on r&d, software development and technology. Beyond Canada’s auto factories and the suppliers pulses a third automotive stratum, one that extends well beyond the borders of Ontario. Canadian universities and tech schools are immersed in efforts to make vehicles and transportation cleaner, safer and more efficient. Backed by industry and government — with $250 million invested through federal programs alone since 2007 — the research reaches into almost every facet of a rapidly evolving automotive world. “We’re supporting researchers, we’re supporting young people, we’re helping develop the technologies of tomorrow — the scientific knowledge of tomorrow — so it’s a very easy job to get behind,” said Jeff Nerenberg, director of Canada’s lead funding agency, the Natural Sciences and Engineering Research Council (NSERC). The University of Waterloo, about 130 kilometres west of Toronto, is home to Canada’s largest engineering school and is a top-ranked computer studies program. It’s the transportation research leader. 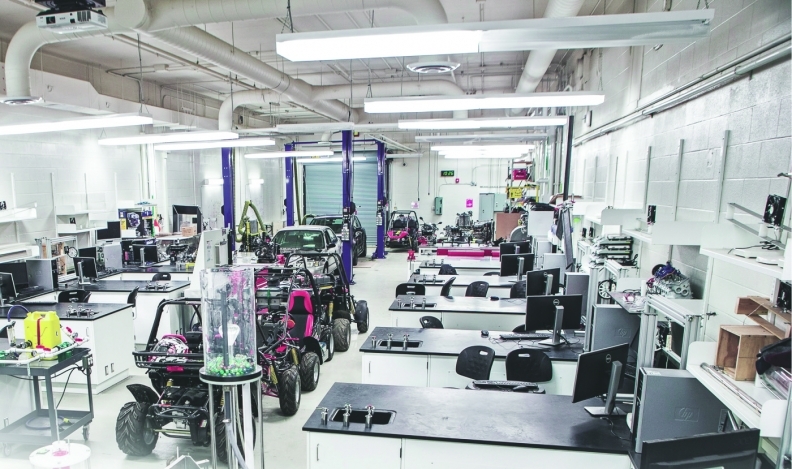 The school has projects with all five automakers that manufacture in Canada and more than 130 professors studying topics from self-driving cars to chassis architecture. “With the convergence in vehicles of IT and engineering over the past seven years, Waterloo is well positioned,” said a spokesman who points to “a strong critical mass” of graduate-student researchers, academics and infrastructure. The latest achievement: a potential breakthrough in electrode technology that project leader Quanquan Pang said could triple the range of batteries in electric cars. Brandon University students and Cypher Environmental technicians are involved in a project to create more durable and less dusty dirt roads. But Waterloo is not the only school studying energy storage in a world that is quickly electrifying. The nearby Western University in London, Ont., signed a $3.35-million agreement with researchers in China in December 2017 to set up a joint laboratory to develop solid-state batteries, and McMaster University in Hamilton, Ont., is starting a company to make advanced cell testers for EVs. At Dalhousie University in Halifax, Tesla Inc. is backing Jeff Dahn, a world leader in battery research, and his team of 20 graduate students, postdoctoral researchers and technical staff in a project that will last at least five years. Financial terms haven’t been disclosed, but the university calls the amount “substantial.” At the University of Ontario Institute of Technology, in Oshawa, Ont., Sheldon Williamson is investigating ultracapacitors — which store energy in an electric field as opposed to a battery’s chemicals — for transit buses and other storage systems. Elsewhere, topics range from self-healing, corrosion-resistant “nanocomposite” coatings (University of Prince Edward Island) to even more arcane “optical variable nanostructures” for encrypted keyless entry systems (Simon Fraser University in Burnaby, B.C.). Meantime, students from Memorial University in St. John’s, Nfld., and Northeastern University in Boston placed second in Elon Musk’s international Hyperloop Competition. Projects run the full spectrum. Brandon University in Manitoba is on a quest for a better dirt road and the University of New Brunswick with campuses in Fredericton and Saint John has a five-year study of volunteer-driver programs to help older rural adults who can no longer drive themselves. What might be most notable is how quickly the robust research scene emerged. Before the launch in 2001 of Auto21, a federal program to spur innovation, only three Canadian universities were working with automakers, says Peter Frise, a University of Windsor engineering professor and former Auto21 director. By its closure in 2016, the program was Canada’s largest research network. “We had 48 universities. We funded over 500 professors, working with 300 companies. We helped train more than 2,500 students and did more than $150 million worth of work over that 14 years,” says Frise. Frise’s one regret is that university research funding now lacks Auto21’s focus on economic benefit. At the same time, programs that supported automaker and supplier research and development have been folded into the government’s $1.26-billion Strategic Innovation Fund, which covers a broad range of industries. By contrast, countries such as Germany and Great Britain build innovation programs around jobs and investment in specific sectors, Frise says. A spokesman for federal innovations minister Navdeep Bains insists the auto industry ranks among the “dynamic and innovative” sectors the government wants to nurture. “Support for new high-quality business investments will continue to be available for the automotive manufacturing sector through the Strategic Innovation Fund,” said press secretary Karl Sasseville. NSERC’s dollars, meantime, promote research in areas that have emerged as Canadian strengths: materials and lightweighting; hydrogen fuel cells; and now artificial intelligence and connected vehicles. But for Nerenberg, the agency’s regional development director, the biggest payoff for the auto industry and Canadian economy is in people. To read about eight automotive research projects 10 Canadian universities are working on, go here.